We are instrumental in offering Abrasive Mounted Points to our clients. Mounted points made from alumina & silicon carbide materials can grind hard or strength end materials. As the name suggests these are small grinding wheels mounted to steel shanks and are primarily used on portable hand grinding machine and clamped in position by means of a collet. These Abrasive Mounted Points are ideal small tools both for coarse, heavy duty work and for superfine grinding work on precision parts. Supreme Abrasives was established in the year 1993. 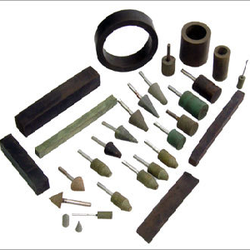 We are manufacturer and supplier of 3 MM Elastic Abrasive Shank , Abrasive Rubber Points, Thin Cutting Grinding Wheel, Centreless Wheels, Grinding Cup Wheels, Abrasive Mounted Points, Diamond Mounted Points, Electroplated Internal Wheel and Diamond Internal Grinding Wheel. The range is offered in various sizes, dimension and shapes, suiting customer requirements, perfectly. It is manufactured using high grade raw material, which is procured from reliable vendors only. These products are widely appreciable in the industry for their accurate adjustment, rugged construction and durability. Also, it is qualitatively manufactured as per the specification submitted by customers assisting us in winning their maximum satisfaction. With the assistance of our qualified engineers, we are giving shape to varied products as per the market trend. Our team helps us in making our stand alone in the industry through their hard work and dedication. They work round the clock for the benefit and success of our organization and clients. The personnel use advanced machines and tools in making of the gamut assisting us in meeting market demand on time. Moreover, the packaging experts pack the range in quality packaging material like corrugated and wooden boxes saving it from any kind of damage during transit.